Here are a few of the major works where traffic flow will be affected. All dates are weather permitted. • Brookside Drive – Extension of storm sewer, curb and gutter. Road base upgrade as well as replacement of new asphalt surface. • Canada Street – Reconstruction of retaining wall beginning on June 25 and should be completed by July 30. • St Mary’s Street – Upgrading of road base as well as replacement of the asphalt surface beginning on May 28 and be completed by June 8. 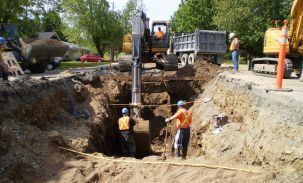 • North Side Trunk Sanitary Sewer Renewal - Replace the sanitary trunk between Southview Condominiums and Ducks Unlimited in addition to the crossing Union Street near Station Road. Closure should last 10 days. • Bishop Drive – Construction of a Roundabout, replacement of roadway, including curb/gutter, road base and asphalt surface. A detour will be in place. • Cliffe Street/Two Nations Crossing Roundabout – Construction of a Roundabout, replacement of roadway, including curb/gutter, road base and asphalt surface. Traffic disruption should be minimal. • York Street (Edinburgh Street – Albert Street) – Storm sewer renewal and a detour will be in place. A list of all summer road construction as well as construction maps, have been posted to the City of Fredericton website at www.fredericton.ca . Details of major closures will be announced as contracts are tendered and weather permits.